So we were heading to Memphis and, lo and behold, along the future I-22 corridor between Birmingham and the birthplace of rock ‘n roll, lay two burger joints on “the list”. 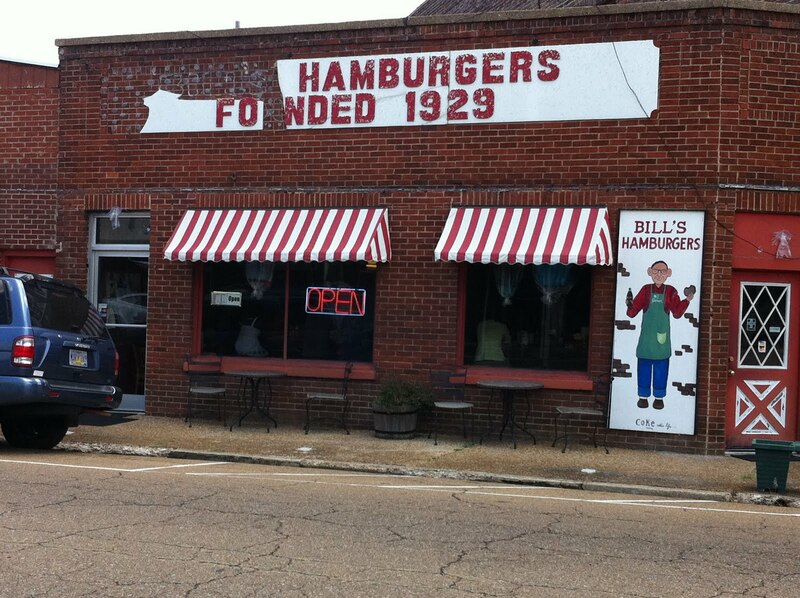 The first was Bill’s Hamburgers in Amory, MS, just across the Mississippi line, leaving Alabama. As the sign says, it was founded in 1929. 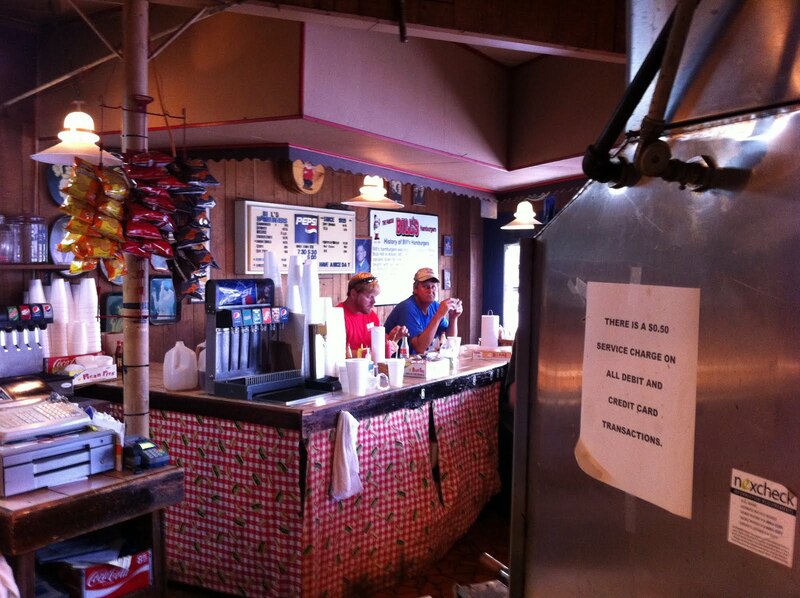 It started as Bob’s and became Bill’s when it was sold to an employee in the fifties. Inside, it is simple, a long counter and a few tables. They open at 7:30 and don’t serve breakfast. They start serving burgers then. mostly to folks coming off the night shift. The burgers are straightforward – mustard, onion, beef and bun. There is no lettuce or tomato available. There also is very little tableware. We ordered at the counter and took a seat at a table. 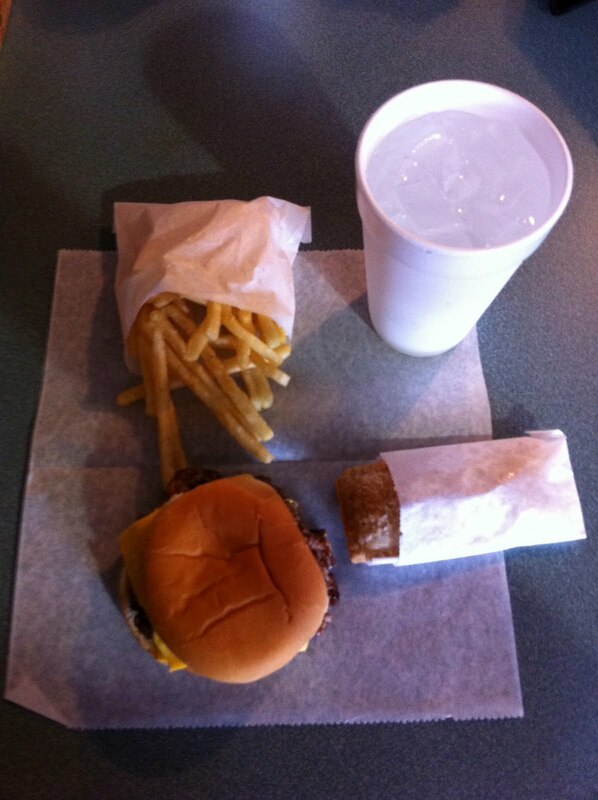 The waitress arrived a few minutes later with two sheets of wax paper, a bag of fries and a bag of onion rings. A minute later she was back with a burger in each plastic-gloved hand. No frills, for sure. Sadly, the food didn’t even approach good. Even the apple pie was bad. * In case you were wondering – that was thinly veiled reference to the first line of the Outsiders, which I quote most of the time when I walk out of dark place into the bright sunlight. The actual beginning to the book involves a theater and ride home, as opposed to a restaurant and another burger.